differencemakers community blog: Where do you stand on the leaders ladder? Even good leaders tell me that they are spending 25% of their time solving or attempting to solve so called people problems. 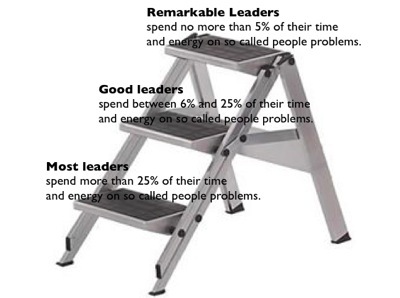 Where do you stand on the leaders ladder below? If you stand where good or most leaders do and want to step up and be remarkable I can help you. I am in the process of completing my Enhancing Their Gifts™ system, the culmination of my life’s work to make it simple for leaders to ensure that the majority of your people are performing at their best on a consistent basis. And as I complete the development of this system there is a never to be repeated opportunity for a limited number of organisations. Find out all about this opportunity here.